Paving the way for a safer internet. HTTP vs. HTTPS—what’s the difference, and are you secure? While browsing the web, you may have noticed some sites being listed as “Not Secure” recently. This is the result of Google’s newest Chrome update 68, which is part of a series of updates that have been in the making for about two years now. Google’s overall goal for these updates is to move websites towards using HTTPS, rather than HTTP, to promote a more secure internet browsing experience for everyone. To forgo any added jargon, HTTP (HyperText Transfer Protocol) and HTTPS (HyperText Transfer Protocol Secure) are the backbones of the entire internet—this is how all data is transferred across the web. As a result, you can see why having a secured connection when accessing any given website would be important. However, this can be a concerning change for many business owners that still have their sites under HTTP. No one wants their customers and visitors to be bouncing off of their websites when they see “Not Secure” displayed prominently. Especially when nearly 60% of web users have Google Chrome as their go-to browser (source: StatCounter). Not to raise any fire alarms, but this is just the start of Chrome’s transition. If you browse the web using chrome—and we’re going to take a gamble and say you probably do—you might have noticed a green lock with “Secure” listed next to it. On the off-chance, check out our URL in the top left of your browser. If you haven’t noticed Google’s trusted security lock, check out what it looks like in our URL in the top left of your browser. Google is making Secure the norm. Starting in September 2018, it’s time to say our goodbyes to that trusted green lock. Chrome’s next update will be phasing it out, with the intention of only creating notifications for unsecured websites. 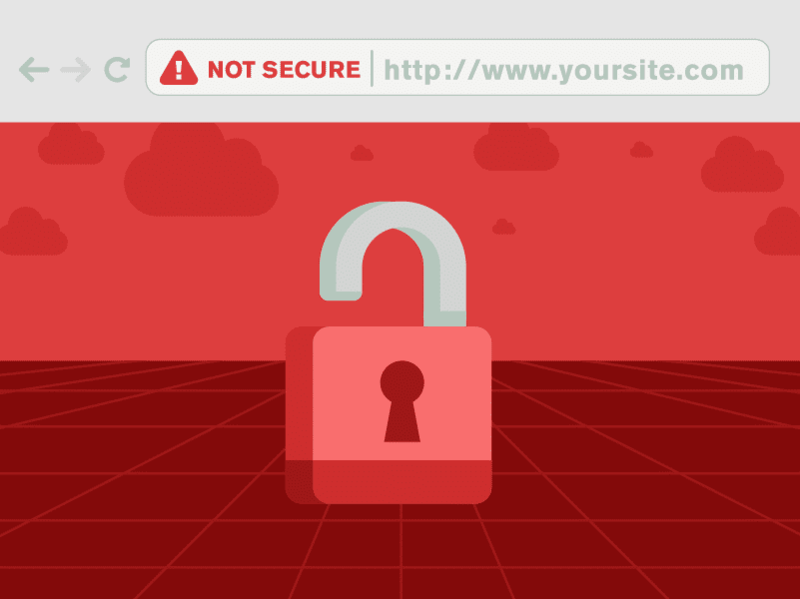 In October 2018, Chrome will up the ante and begin displaying “Not Secure” websites in red with a caution sign next to it. October 2018 marks the Google Chrome 70 update. Unsecured HTTP sites will begin to be displayed in red, along with a warning sign. Say hello to a Really Simple solution. That said, this isn’t doomsday waiting to happen. Despite what may seem like a headache, fortunately, the fix is pretty easy if you’re using WordPress. First and foremost, you’ll be needing an SSL certificate. Acquiring one can be either straightforward or a more involved process, depending on your website’s host. In fact, many hosting sites nowadays already include SSL with their service. Activate the Really Simple SSL plugin. Enable SSL with one click. There are a few last steps to complete the change, including updating your sitemap, webmaster tools, CDN, analytics and social share accounts with your updated URL. If you’re already familiar with WordPress, then this is no problem. If not, don’t worry—Mighty Fine Design Co. is here to help. We offer a quick and inexpensive fix for WordPress users. Contact us today, and we’d be more than happy to have a conversation on how we can assist you with it.